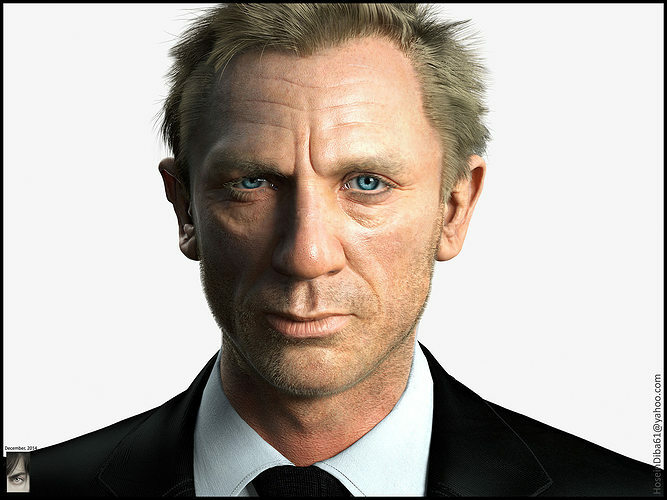 Hey guys, I did sculpt of Daniel Craig almost 2 years ago(late 2012) based on Luc Begin's 3D model of him(as a study on how to add facial details in zbrush) and as recently one of my friends suggested to create an advance facial rig for him, I decided to work more on him, trying to get closer to the ref and also enhance level of realism. It has been a long time since I wanted to work on my zbrush rendering skills but couldn't find an in-depth tutorial for that but thanks to Rafael Grassetti who released an amazing tutorial recently covering sculpting and rendering techniques in zbrush, I could find answers to lots of questions I had about BPR renders and also nailing likeness using zapplink, so here we are, a new version of Daniel craig's sculpt. It was the first time I used Ornatrix for hair and liked it but I did hair on my final renders with fiber to hair and fur(I had better control cause I'm used to it not because it's better than ornatrix!). I had to change my skin shader a bit (Due to some reflection&glossiness issues in previous versions) I watched Adam Lewis's DT Skin, Andrew Hakim Lie's "Stan The Man" and Luc Begin's Daniel Craig tutorials and tried to combine those 3 settings for skin and here is the result, Cheers. Wow !! This is amazing ! Which program did you use ?